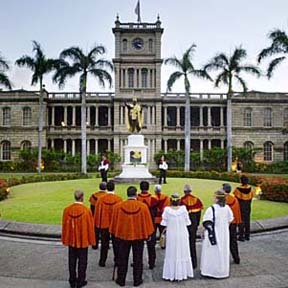 Members of the Royal Order of Kamehameha I gathered yesterday evening at the king's statue in front of Ali'iolani Hale for a ceremony commemorating June 10, 1903, when Prince Jonah Kalanianaole Kuhio openly declared the restoration of the Royal Order. The order had been underground after the overthrow of the monarchy. Today is Kamehameha Day, a state holiday honoring the Hawaiian king.